The delightful sound of a light summer rain can be music to your ears when you are listening to it on a lazy, relaxing weekend. But if, while you are resting, you suddenly feel water dripping on your head, that is not quite so pleasant. You instantly get that knot in your stomach as you wonder just how many years it has been since you had that roof installed. You fear you’ll be going through that stressful experience all over again. But will you really? Perhaps not, if you give us a call at Slippery Slope Roofing. We put our 50 combined years of roofing experience in the Alliston, ON area to work to come up with a roofing repair solution whenever possible and feasible. In fact, if you have already had another roofing contractor inform you that you need a new roof, we invite you to call us for a second opinion. While others are only interested in the bigger fish, namely a reroofing, our level of expertise and integrity means we’ll do a roof repair whenever that makes more sense and never push you into doing a replacement if it really isn’t needed quite yet. On the flip side, we won’t subject you to what would be a roof repair today followed by a string of numerous and frequent roofing repairs over the next few years if it is obvious that the roof has reached its end. No style of roof is designed to live forever, unfortunately. 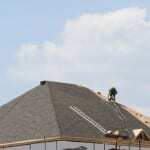 If it is not cost-effective to do a roof repair, we’ll let you know that. It never costs you anything to have us come check out your home’s roof and give a quote for a roofing repair or a replacement. Give us a call today, so you can go back to enjoying that next rainfall.